In the world of blogging for business, we have entered the arms race era. As I’ve talked about before, it’s not about blogs these days, it’s about blog posts. The day-to-day audience that reads a particular blog every day, fed to them by email and/or RSS, is fading away. Instead, we have enormous competition to create “hit” blog posts that break out and find a larger-than-usual audience, fueled by social media and search engines. In fact, we spend a lot of time methodically trying to create those hits here at Convince & Convert, and use software and our own intuition (and a killer team of guest writers) to do so. Our analysis shows that comprehensive posts outperform concise posts, as a general rule. 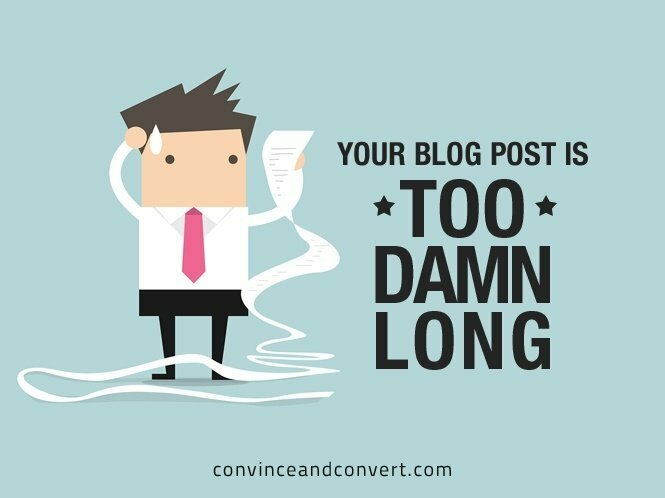 Long > short, is the generally accepted practice at present, and that conventional wisdom has produced a huge increase in a particular type of content…..I’m certain you’ve noticed this too….the rise of the impossibly detailed blog post? But at some point, there is a practical limit to that kind of content, is there not? If your “blog post” is the same length as many ebooks available on Amazon, might you be swamping your audience’s informational boat a bit? As a marketer, my thought is that the authors of these very, very, very long posts would actually get more bang for their attention-seeking buck if they broke this content up into pieces. More chum in the water, so to speak. I suppose I should test this concept, but to me I’d rather publish “24 ways to rewrite your headlines for success” on Monday, followed by “24 more ways to rewrite your headlines for success” the following Monday, and “The final 25 ways to rewrite your headlines for success” on the third Monday. Isn’t having three solid pieces a better plan than the single bite of the apple provided by the “73 ways…” approach? Or maybe I just don’t get it? Maybe longer is innately better every time, and in all respects? As a heavy consumer of digital content of all types, I say to myself when I see content of this type “Your blog post is too damn long!” Because really, if you give me a list of 142 tools (or some such) what service are you actually providing at that point? What you’re doing isn’t a careful, thoughtful curation, it’s just click bait dressed up in “we left NO stone unturned!” clothing. I don’t need or want a full catalogue of tools (or ideas, or tips, or tricks, or case studies, or best practices, or trends, or anything else). We already have a great solution for finding all of whatever you need to know. We call it Google search.